The Village of Westbury recently designated six sites as historic landmarks in an effort to celebrate the rich foundation the community was built upon. In the coming weeks, The Westbury Times will be taking a closer look at these significant sites, which have had an indelible effect in shaping Westbury into the community it is today. Long Island’s Vanderbilt Cup Races were one of the most prominent and awe-inspiring forms of entertainment just after the turn of the century, running one day in October from 1904 to 1906 and again from 1908 to 1910. 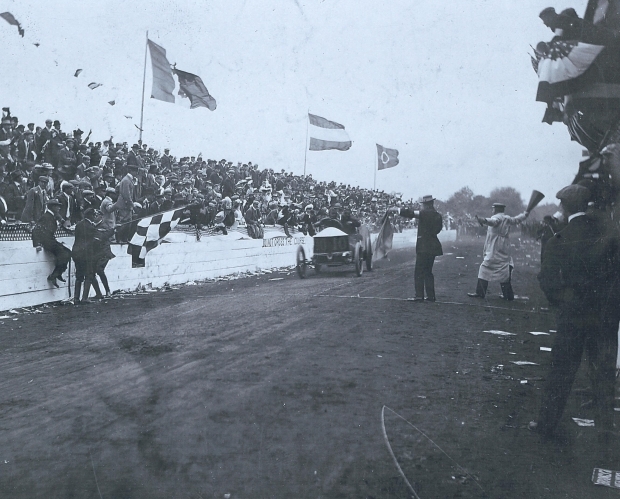 Held on local roads such as Jericho Turnpike and Massapequa-Hicksville Road at their initiation, the races drew crowds of tens, and later hundreds, of thousands of people from Long Island, New York City and beyond, according to town historian of North Hempstead Howard Kroplick.A Westbury grandstand served as the starting and ending point of the Vanderbilt Cup Race twice throughout the race’s history, and its location will be officially recognized as a historical landmark with a placard from the Village of Westbury. The commemorative sign is scheduled to be put up on the corner of Cambridge Avenue and Jericho Turnpike, said Westbury Village Historian Gary Monti. The races were established by William K. Vanderbilt Jr., the great-grandson of Cornelius Vanderbilt, in order to “encourage American automobile manufacturers to improve their products in comparison with European automobile manufacturers,” said Kroplick. “Pure excitement,” were the words he used to describe the atmosphere at the races. Car racing was a new phenomenon, and the Vanderbilt Cup Races drew in hordes of people eager to watch it for the first time. However, the races were as dangerous as they were thrilling. Throngs of people stood on the roadsides as the cars flew by, sometimes at 100 miles per hour, said both Monti and Kroplick. Kroplick’s website, www.vanderbiltcupraces.com, highlights the history and hazards of the cup races. The first spectator death occurred in 1906, prompting the building of the Long Island Motor Parkway, the United States’ first parkway designed solely for motor vehicle use. The race was permanently ended on Long Island after two driving mechanics’ deaths in 1910 and the parkway closed in 1938. But even with the tragedies they caused, the Vanderbilt Cup Races made a profound imprint on Long Island’s history and the history of automobiles in the United States as a whole. 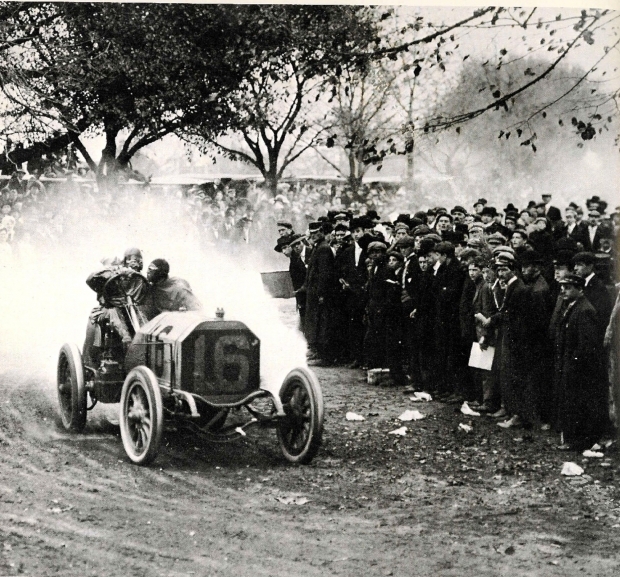 As the United States’ first international motorcar race and one of its most notable sporting events to this day, the Vanderbilt Cup Races were not only key in raising automobile popularity, but also in bringing about automotive improvements and greater safety measures for racing’s future, Kroplick said. “It was one of the most significant races in the history of motor sports,” said Monti, explaining that numerous locals today do not know about the Vanderbilt Cup because the racing sites show no signs of their past. “The marker will educate residents and visitors [on] these historically significant races that drew thousands to Westbury soon after the dawn of the automobile,” said Kroplick. His website, which has been awarded as one of the world’s top five Car Culture sites, provides historical and current information about automobiles on Long Island. Along with the Long Island Motor Parkway Preservation Society, Kroplick’s website helps keep the spirit of the Vanderbilt Cup Races alive today. 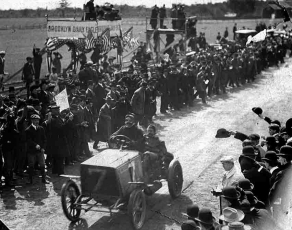 George Heath winning the 1904 Vanderbilt Cup Race for France in a 90-HP Panhard on Jericho Turnpike in Westbury. Louis Wagner winning the 1906 Vanderbilt Cup Race in a French Darracq, averaging 60.8 mph. It was the first known use of a checkered flag to signify the finish of an automobile race. I am glad to see that another sacred place is being recognized. I am trying to get more people to join the Preservation Society. My brother just helped me find my sister through Facebook and if she ever has any free time I will try to get her, her husband and their two kids into it. I haven’t heard from her in nearly seventeen years but she was looking for me too. As someone who grew up in westbury, this is great news. I wonder what the other historical places are. I’ll have to grab a cow of the Westbury Times I guess. The Westbury grandstand was a bit further east on Jericho Tpk, closer to powells lane so that might have been a better location but very glad marker is being done. Don’t want to complain about exact spot!